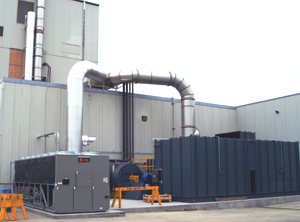 Controlled Environment Equipment was called in by a Midwest Food manufacturer to control the air pollution byproducts of one of their processes. The exhaust from their process was 25,000 scfm and contained ethanol that exceeded the EPA Code emissions for the area. Controlled Environment recommended a two bed Regenerative Oxidizer to convert the ethanol byproduct to harmless water vapor and carbon dioxide (normal byproducts of combustion.) The Regenerative Oxidizer was recommended because it only required 3% LEL to maintain the combustion process resulting in little to no auxiliary fuel usage. Due to the acidic nature of the ethanol, the ductwork required to bring the process exhaust to the oxidizer was constructed of 316ss and insulated to prevent condensation of the ethanol byproduct. In addition, the Regenerative Oxidizer, as a result of destroying the air pollutant, generated waste heat which could be recovered to the process and result in fuel cost savings. So, Controlled Environment proposed a glycol coil heat recovery system. This system contains a glycol coil in the exhaust air stream of the oxidizer and a coil in the intake supply to the dryer process in the plant. The supply air to the process is 20,000 scfm and it needs to be heated to 300°F. The heat recovery raises the incoming air by 140°F, which amounts to approximately 3,000,000 btu/hr, and at $1.00 per therm for natural gas, they save $30 per hour in operating costs. In combination with the heat recovery intake supply to the process dryer, we recommended a chiller to lower the incoming dew point to 40°F, which increases the quality and quantity of product that could be produced by the dryer process. So, in addition to a Regenerative Oxidizer to destroy the ethanol air pollutant and a heat recovery system to recover the waste heat to the process, the system included a 280 Ton chiller to improve production capabilities. All three pieces of equipment work as one system and are tied together with a PLC control device. Needless to say, the customer was very pleased with a three device system tied together to meet EPA standards, save on operating costs of the process and increase production capabilities.